On this overcast morning, I’m in a blue Pontiac GTO parked by the runway at Beale Air Force Base near Sacramento, California. Major Tony, a U-2 pilot (last name withheld for operational security reasons), is at the wheel, telling tales of botched landings. There’s no shortage of material: setting down a U-2 requires a deft touch. The plane’s tricky landing dynamics are a fundamental by-product of its design. Long, thin wings and a short, needle-like body provide the high lift and low drag necessary for what pilots casually call high flight – U-2s commonly cruise above 21 000 metres, twice as high as a commercial airliner – but they cripple low-speed handling. And the centre-mounted landing gear, configured to reduce weight, means the plane sets down like a flying bicycle. All that has earned the U-2 the distinction of the most difficult aircraft to fly in the US Air Force. In 57 years of operation, just 920 pilots have been certified to fly what is nicknamed the Dragon Lady. 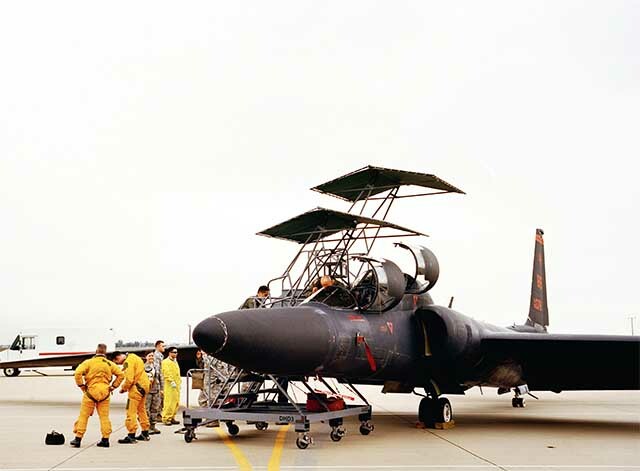 Because the spy plane’s pilots are so taxed, the Air Force long ago mandated that chase cars driven by U-2 pilots follow the craft for landings, talking the pilots through touchdown. The chase cars typically have powerful, torquey engines – in addition to the GTOs, the fleet includes Pontiac G8 GTs and Camaro Super Sports, largely because these can launch from a standstill to landing speed in roughly 400 metres. The drivers, known as mobile pilots, race behind the planes as they land, radioing reports on altitude and attitude. “You can’t get too close to the plane or you’ll burn the paint off the bonnet,” Major Tony says, “but too far and you’re not much help to the pilot.” The preferred position: three car lengths behind the tail and slightly to the side to avoid the wash of the U-2’s 75 600-newton turbofan. On this day of go/no-go weather, the primary chase car is a Pontiac GTO; Major Tony and I are following in another GTO, which has been driven hard. The doors are dented and the nose is faded and specked with rock chips. The upholstery is frayed, the plastic door panels are scratched, and dash trim fits poorly. A VHF/UHF radio is installed in the car; the control box and microphone are on the console. About 10 minutes after we park near the end of Beale’s 3 600 m-long runway, the first aircraft of the day appears in the distance. I’ve been around planes all my life – my father was a flight instructor when I was a boy – but I’ve never seen anything in the air like a U-2. It has a birdlike elegance that’s missing from contemporary military aircraft. It looks like a giant gull with waving wings. This one is a two-seat trainer with tandem canopies. It floats in from the left and banks in a long, sweeping arc. When it’s almost on top of us, the primary chase car guns it; Major Tony follows a short distance behind. By the time we roll on to the runway, we’re doing about 130 km/h. The major is pilot cool, driving casually with one hand on the wheel and the other on the radio mic. The plane flies overhead, clearing the roof panel of the primary car by what seems like a few centimetres but is probably much more. It suddenly fills our windshield – a jinking, floating sea of matte black. Over the radio, we hear the primary driver spew a steady stream of data to the pilot on landing-gear height and roll angle as both cars rip down the tarmac, throttles floored, exhausts blaring. When the U-2 is about half a metre above the runway, the pilot holds off until it stalls, and the plane slams on to the deck, tail wheel first. Heat pours out of the tail and makes the tarmac shimmer. We’re so close that I have a straight line of sight up the plane’s exhaust; the GTO reeks of jet fuel, as if someone had spilled the world’s largest Zippo in my lap. But this is just a practice landing: after coasting for a few seconds, the pilot throttles up again and the U-2 takes off – seemingly vertical, rapidly gaining altitude in a 30-degree climb. The chase cars slow and then return to their positions at the end of the runway for the next touch-and-go. The U-2 is a glimpse into another era, a relic of an age when jet flight was America’s bleeding-edge tech frontier. It’s also a genuine piece of history: John F Kennedy viewed images taken from a U-2 immediately before the Cuban missile crisis. Pilot Francis Gary Powers was famously shot down in one over the Soviet Union, sparking an international incident. That the Lockheed’s relatively simple airframe, designed during the Eisenhower administration, is still in use today is a testament to its genius. Drawn up before the age of surveillance satellites, the U-2 was originally meant to fly above 1950s ground-based defences. As a result, it cruises in the wispy veils of the upper atmosphere. U-2 pilots look up at noon on a sunny day into the inky void of space. They fly without a wingman or co-pilot for up to 12 hours at a time. They’re high enough to view Earth’s curvature with the naked eye, and disorienting decompression sickness – what deep-sea divers call the bends – is a very real threat following long flights. Why expend so much effort for what is effectively a satellite’s view of the world? It’s a common question, and there’s no easy – or at least unclassified – answer. All the Air Force will say is that satellites can’t always be where you want them, and that they can’t talk to soldiers on the ground. Technical updates have kept the plane relevant, and its relative fuel efficiency keeps operating costs low. The U-2’s current wet-film camera, an SR-71 Blackbird hand-me-down, offers greater resolution than anything digital. 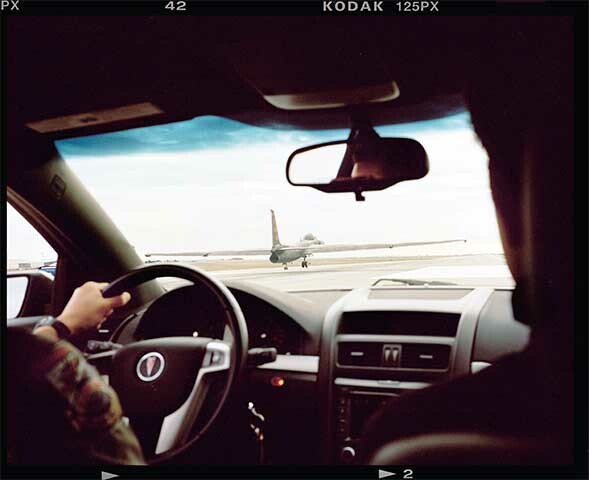 A datalink allows pilots to send information to ground troops in near-real time. Given today’s technology and each flight’s inherent danger, it’s amazing that this remnant of a bygone age still sweeps the skies. After three runs in the chase car, the smell of jet fuel is overwhelming. I almost feel it condense on my skin, and the air takes on an oily thickness that makes it hard to focus my eyes. Major Tony is used to it, but I’m ready to puke. (1) The CIA ran the early years of the U-2 project. Pilots who transferred in from the Air Force simply disappeared one day, or in Pentagon terminology, “evanesced”. (2) The Air Force says the U-2’s range is more than 8 000 km. (3) The resolution of the decades-old wet-film camera is sharp enough to see roadside bombs from 21 000 m.
(4) As part of the evaluation process, pilot candidates are asked to wear the U-2 pressure suit and sit in a corner in a dark room for an hour to ensure that they’re not claustrophobic. (5) Although the military won’t confirm or deny it, knowledgeable sources claim that the majority of visual intelligence in the war on terror comes from U-2 flights, not drones or satellites. Video: Watch Top Gear’s James May as he chases the dragon lady in a Pontiac GTO.